Hot Potato? Well maybe not a hot potato but that is a common phrase given to a live hand grenade after the pin is pulled. 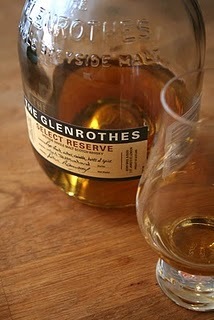 I pulled my pin and I thought it time to pass on my comments about the Glenrothes Select Reserve (aka The Grenade). I have been interested in this whisky from the first moment I saw it on the store shelf. A unique shape: short, squat and round. The shape does make it a bit hard to handle when the lights are low and the bottle neck has a tendency to pour a wee bit more than anticipated. Packaging is a bit average though being nothing more than a flimsy cardboard wrap open on two sides making you think the bottle is going to fall out every time you pick it up. I have been impressed by how passionate The Glenrothes is about the product and how well presented the supporting website is. Unfortunately, this is where the face value drops off quite quickly. When recently attending Whisky Live Sydney, The Glenrothes was present and one of the first stalls off the rank. 'Excellent!' I thought (as I had not opened my bottle yet) and really wanted to have a talk to these chaps about the product and the distillery (queue wrong answer sound, BA-BOW). It is a real pity when you know more about the product than the stupid reps at the table, and I had not even tasted it yet (pick up your game lads). Maybe the disappointment at this stage had tainted my pallet, I really hoped so, because I was not impressed at all with the variations I had sampled on the night. Bummer. On with the show though and what I think about The Glenrothes Select Reserve Speyside Single Malt Scotch Whisky. On the nose: this is a typical Speyside with lots of citrus floral notes with a hint of spice and vanilla. I find it to have a thicker than usual character to it and certainly enticing to taste. On the pallet is a softness but subsides to a bitterness in the middle and to the sides of the mouth. All the soft floral elements are lost very quickly and if you leave it in the mouth to long the alcohol burn starts to permeate into the nose. It find it very hard to explain exactly what the tastes are. Generally speaking when tasting Single Malt Scotch Whisky one can find something like the oak, salt, brine, butter, caramel... not for me on this one. I am guessing maybe this is why The Glenrothes is used so much for blends as it allows for other whiskies to come forward when blended. The finish is quite short and a bit lack luster. Some whiskies burn, some warm, some linger, and some jump straight back up to the pallet and tickle with a feather. Unfortunately the Select Reserve is none of these exclusively and a little bit off all leaving me wonder where all the romance went. Slightly warming and a tingle on the tongue long after. On the dram-o-meter I have to give this a 4 1/2 out of 7. Not impressive but nice overall. I would drink it if it was on offer, but would waver at buying another bottle. I want this to be better and every time I pour a dram I keep thinking the same thing 'what am I missing.' A lot apparently. What can I say about the product? I had mentioned somewhere else that I felt this to be, for lack of a better term, 'a settlers whisky.' What I mean by that is it seems suited to someone who likes whisky, happy to have a old style single malt on occasion, found a taste they like, and not willing to go out of their way to try something new or buy anything else. Safe and unassuming and a slight step up from you typical entry level single malt. I personally would prefer a Chivas 12yo blend over a Glenrothes Select Reserve. Obviously it just does not fit my pallet. I found the whisky improves after coffee. Possibly this is because coffee is a great pallet cleanser which gives this whiskey an opportunity to shine on its own. It might be the slight hint of cocoa bitterness allowing the enhancement of the whisky. It might just be the whisky is a great accompaniment to other ingestible items. The Glenrothes website is excellent and very informative for anyone whom wants to know about the processes of whisky making from start to finish. Check out the post about the movie The Glenrothes has on their site. 7 out of 7 for that and almost an R rating when Ronnie Cox gets down and dirty with the whisky itself. The reps at Whisky Live Sydney said that 90% of all The Glenrothes goes into the Cutty Sark, Black Douglas and The Famous Grouse blends. Now these guys were not what you call the most knowledgeable or passionate reps I have met and so I take this portion of info that a bag of salt liberally applied. This whisky also has a synthetic stopper rather than a cork. No smell and not taint. I like it. Don't expect a lot and you won't be disappointed in this whisky.